I’ve lost over 15 lbs in a little over a month!!! For those who aren’t familiar, I mentioned some weight loss bets I made a little over a month ago in my previous entry. Basically, before Christmas, I had a $50 weight loss bet with a friend to lose 15 lbs over 2 or 3 months. I was doing all right, I think I lost 10 lbs or something but then eventually gave up and gained weight back. As a sort of New Year’s resolution, I decided to try to redeem myself and asked the friend if we could do a double or nothing weight loss bet (I pay $100 total if I lose, or break even over both bets if I win). We came to an agreement of 15 lbs (I started at 215!) over a 3 month period. I also made a second weight loss bet with a friend at school. This was also a 3 month $50 bet but involves losing more weight than the other. We decided to put a cap on weight-loss such that if both of us lost the cap amount or more, then we’d tie. This cap started off as 35 lbs (~3 lbs/week) but we lowered it to 25 lbs (~2 lbs/week) since 35 is a ridiculous amount to lose over 12 weeks (and probably unhealthy). I describe the changes I’ve made below along with progress updates. Well, so far so good. Everything is working out much better than I expected. I had two weight loss bets and I’ve already won the first one (assuming I can at least maintain my weight for another two months). I’ve also been recording a bunch of things in the above bullet at fitday.com which is a pretty sweet site. It will calculate approximately how many Calories you take in, how many you burn, how much fat, protein, and carbs you take in (and a ton of other stuff). I signed up for a nutrition program where a nutrition student outlined about how many Calories I should take in per day as well as what types of foods and how much protein and carbs. I’ve already lost over 15 lbs!! One thing I still really need to work on is getting better and more consistent sleep. However, I have improved so that’s good. We’re going to start a new workout intending to work different muscle groups (with pushing and pulling exercises). I mentioned FitDay earlier, here is a link to my FitDay public profile. I haven’t updated the food log in a few days but you can go through an archive of approximately what I’ve eaten every day since the competition started. 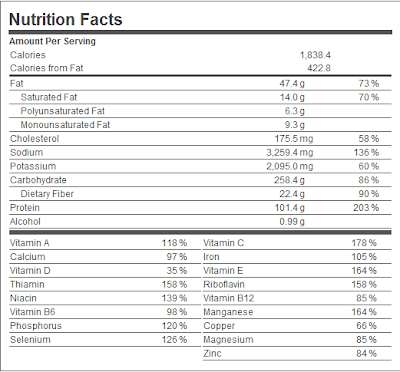 It gives nutritional information and shows the weight fluctuations for that week. 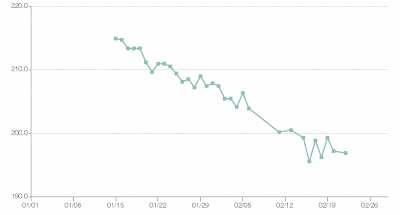 It’s always nice to see that my weight loss graph has stayed below my goal for the duration of the bet! Some of the high numbers after starting are from not recording and thus averaging over a smaller week sample (like when I caught the flu). Anyway, in terms of my Calorie breakdown (in percentages) in Carbs/Fat/Protein, I’ve averaged 55/23/22. I’ve heard of two different goals to aim for: 40/30/30 from a friend and 60/20/20 from a Smoothies recipe book. I’m not too disappointed with my numbers as it’s somewhere in between. If anyone has any comments, questions, or especially suggestions about nutrition/working out/lifestyle, please leave some comments for me at the end of the blog. 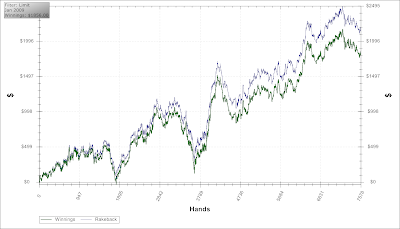 Now on to my poker blog, you can stop reading now if you came to read about the weight loss bet. 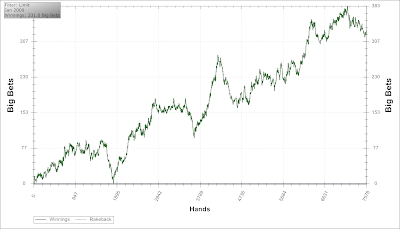 I had a pretty good January, especially considering how few hands I put in. I obviously ran really well (especially at heads-up). However, I think my game has really improved a lot over the last little while (thanks a ton to my coach BigBadBabar from 2p2/DeucesCracked). The main strategy help I got from involved 3betting the SB from the BB and capping HU in position. Most of the improvements, however, have simply been psychological as I have a much better approach to the game now. I generally play fewer tables than I used to, don’t check my results during a session (generally), and am trying to implement a daily stop-loss. I played for about 25 hrs and made $74/hr + rakeback (over $10/hr) which is pretty sweet. Note that I am becoming even LAGgier. I played 35/27/1.9 but believe I had a significant edge on most of my opponents. I try to table- and seat-select a bit when I play so that always helps. It looks like I’m becoming even more stubborn and showdown-bound. I won when I saw the flop 47% of the time and went to showdown 47%! Thus, my W$SD is obviously < 50%. I didn’t really play tournaments at all. I played a few on a whim but didn’t get into them. I was talking to a friend recently (actually, the one I’m competing against in the weight loss bet) and he got me thinking. I should withdraw a bunch of my roll and deposit it into a high-interest savings account. I could always redeposit onto the poker site if I had a downswing. Withdrawing some now might be a good time as the exchange rate is something like $1 US = $1.25 CAD. That means withdrawing 5k US would be equivalent to over 6k CAD. Also, I need to pay off my student credit card, I didn’t know that your credit card rating is affected negatively just for having an outstanding balance, I thought you only get dinged when you are late on payments. I should have done this a while ago anyway because of the ridiculous interest rates the credit card companies charge. Research has been going much better as of late. I’m working on multiplayer (specifically, 3-player) texas hold’em games. However, there are lots of complications with creating a 3-player equilibrium (and even if said equilibrium could be created, we’re unsure of its effectiveness). Anyway, one thing we decided to do is to look at situations where you initially start with 3 players but then move down to 2 players when someone folds. We can easily solve such 2-player games so I’ve created some small blind-vs.-big blind bots in a 5-bucket abstraction. Something interesting that I’ve discovered is that the SB raises about two-thirds of his hands (mostly folds the rest with little limping) and the BB defends pretty much any two cards. Of these BB defends, the BB 3bets about 29% of the top bucket and about 14% of the middle bucket, IIRC. I actually lost a $5 bet to Bryce where we guessed how often the SB and BB would fold. I guessed something like SB folds 18% and BB folds 8% and Bryce guessed SB folds 25.5% and BB folds 0%. He said he was going to guess a larger number for SB but didn’t want to come off as a nit, haha! Also, I recently got access to a 32GB RAM machine to run a long memory-intensive 3-player hold’em game on. However, after seeing how quickly (slowly is actually a more fitting word) it was running, I discovered that the estimated time of completion of the program was about 15-25 years! Yikes! Here’s a recap of this year’s goals/resolutions from my previous blog entry. I sucessfully cleared the TFPT bonuses last month, I’m not sure if I’ll be able to this month (it will involve a lot of Friday/Saturday play, if so). Also, you say you haven’t had any alcohol like this is a good thing. It has been medically shown that completely stopping alcohol consumption makes you boring. Trust me, it’s in all kinds of medical journals and stuff. I’d hate to see that happen! Hey! Hey! Hey… I said I will likely drink but not like I used to. That doesn’t make me boring… I’ll have some for my birthday, m’kay? I’d post my weight chart but it’d be just a straight line. Mostly a straight line, don’t forget the upwards spike from pickled eggs and sausages! Ya thanks for rubbing it in. I heard that the more your food is mulched up the less energy it takes to digest it. So my plan from here on in is to eat my pickled eggs like I’m swallowing down a pill. Washed down with beer of course. Man I can’t wait to see the results of my new lifestyle!